Ulaanbaatar /MONTSAME/. The foundation-laying ceremony of the Winter Sports Palace has been held in Khan-Uul district in the capital city, where the palace is to be built. At the beginning of the ceremony, the ‘Steppa Arena’ company, responsible for the construction work, highlighted that they will work to put it into operation in 16 months, and gave some information about the sports palace. The winter sports palace is planned to have: - 5,700 sq.m usable area - 2,600 seats - an Olympic-sized ice rink with dimensions of 60 metres by 30 metres - accessible roads and area for people with disabilities - systems for ice rink refrigeration and ventilation widely used in North America and Europe - the possibility to transform the ice rink into a concert venue as well as for the use of other sports. 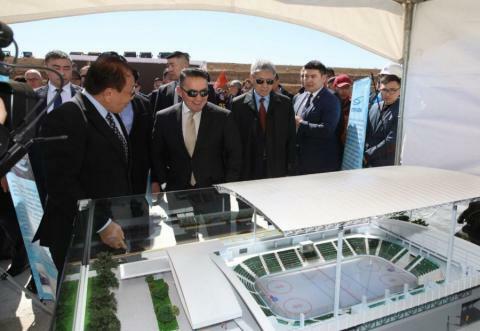 The architectural design was done by the Mongolian company, Anagram LLC, in partnership with the Canadian companies, HDR/CEI and VDA, according to the guideline of the International Hockey Federation. President Kh.Battulga then highlighted that the construction must be finished on time, and gave remarks. He said, “One of the examples of how we, Mongolians, can achieve anything as long as we join together is the decision of the national companies to join forces to build the Winter Sports Palace. The Children of Asia International Sports Games will be organized under the auspices of the President of Mongolia in Ulaanbaatar in August 2020. The East Asian Youth Games will also take place in Ulaanbaatar in 2023. A part of the construction works in preparation for the international sports games is the Winter Sports Palace. Furthermore, a swimming pool of 50 metres and a football stadium with 10,000 seats will be built. As you all may know, we also have the Buyant Ukhaa Sports Complex located closeby. It should be also mentioned that the issue of accommodation for the participating athletes has been resolved. For the hopes and dreams of children, youth and athletes, I hope that the sports complexes--especially, the Winter Sports Palace will be put into operation on time." The President congratulated Mongolian hockey players for becoming the winners of the Challenge Cup of Asia two years in a row with their practices held in outdoor rinks. "As the construction of the winter palace completes, it will then become possible to host Asian as well as other large-scale international tournaments in our home country. I am also confident that the number of children interested in the sport will increase.” After the President’s remarks, national hockey team coach A.Mergen and representative of the new generation of figure skaters G.Maral-Erdene shared their thoughts on how the winter sports palace gives them more motivation. Students training in ice hockey and figure skating did a demonstration show during the ceremony.